Jonathan Taylor's Custom Services in the mid cities offers top-quality, professional construction, fence repair, fence staining, iron fences and more. Serving DFW. Fence Repair (Posts & Boards), Full Replacement, Remodeling and Staining plus Pergolas, Arbors and More! We have been faithfully serving Ft. Worth, Southlake-Keller, Hurst, Euless, Bedford (the mid cities) and surrounding areas since 2006 in various forms of fence repair, staining and construction. Our mission is to provide you with quality work at an affordable rate with a product that outlasts what other companies offer you. We are ready to go the extra mile in order to achieve the vision and goals of our customers. Our company is committed to ensure that you, the homeowner, receive the professional results you deserve. Whether it is a simple replacement of a few boards, a post, an entire fence, deck or arbor/patio cover from start to finish our hearts and professionalism shine through. Your contact info is secure and will never be shared or sold. We respect your privacy and will never spam you. Find us on Dallas.com for reviews and more. InsiderPages listing - Also offering fence construction in Arlington TX, fences in Hurst, Bedford TX, Euless, Flower Mound TX Fence Construction, Grand Prairie and North Richland Hills fence construction - free quotes and same-day services in Park Glens, Summerfield, Highland Oaks, Coventy Hills, Eagle Ranch, Lake Worth, River Oaks, the River Trails area, Harvest Ridge & Sanson Park. Various fence types include dog-run fences, chain link, cedar wood fences, decorative screen fences, antique brick, grape stake, simple wrought iron, tennis court fencing, rough cut cedar and chopped limestone. We now also offer patios and pergola designs across Dallas-Fort Worth. We offer the best in affordable repairs, restoration and much more! If you still need greater privacy or wind protection than a hedge can provide, particularly if you need it ASAP or have an emergency repair situation, the most practical solution is to put up a fence. A fence, being only a few inches wide, takes up little ground space compared to a shrub. It is also a wise precaution to talk to your neighbor on the side of the fence, especially if you are part of an HOA (Homeowner's Association). 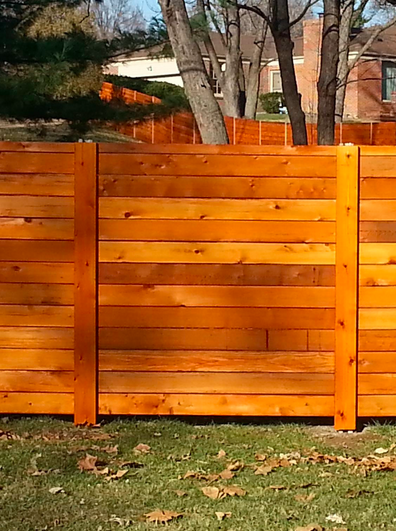 The main trick to fence construction is picking the right look for the job to compliment your yard and surroundings. A low post-and-rail fence, for example, is adequate for defining a boundary line or for supporting vines or climbing roses, but it is virtually useless for privacy screening. Conversely, a high, solid fence of palings or boards, which is good for achieving total privacy or wind control for a service yard or terrace, can create an unwelcoming stockade effect if it is used to surround the entire yard. What can wood fence construction and installation do for your home? In the cheek-by-jowl closeness of modern living, our personal outdoor spaces become increasingly valuable for the privacy they provide. Back yards become havens where family members find solace, pursue leisure activities, and entertain guests; front yards become reflections of their owners - from congenially inviting to outright forbidding. Fences and outdoor screens provide an attractive retreat from the outside world and can keep out nosey neighbors and barking dogs. Many fences and screens also allow for plants and vines to grow on them to add character. We've seen and done it all over the years and are here to help with your next project. Our pricing is affordable without skimping on material and labor costs.